“A family that prays together, stays together.”As members of the family of God at St.Catherine of Siena Parish, we care, and wish to pray with you for your needs. 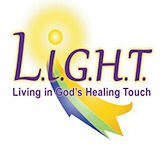 “Living In God’s Healing Touch” is a prayer ministry. We have members of the parish available after the 9:00am and 6:00pm Mass on Sundays, next to the statue of Mary in the church, to pray with you. For more information, contact John or Marla Ustick, at 727-480-7998.